Settled among the rolling hills of the Temecula Valley is Southern California’s wine country. With beautiful vineyards and amazing vistas, this area features award-winning wines from over 30 wineries. 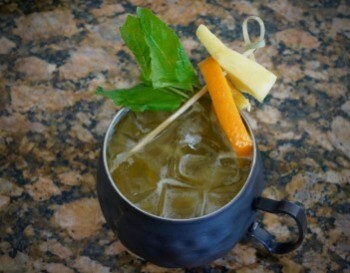 And, along with exceptional wine, Mount Palomar Winery serves cocktails – creative craft cocktails at its full-service bar and restaurant, Annata Bar and Bistro. Italian for “vintage,” Annata was added to the winery in 2015 and has a marvelous view of the valley both from inside the restaurant and on the front patio. Starters and lunch are served all week long, with dinner served Friday through Sunday. Fresh Ceviche and Tempura Style Portabella Fries with spicy soy dipping sauce are excellent choices to accompany your spirited beverages. The cocktail menu is extensive, with several favorites tweaked just enough to enhance the flavorful essence of the original cocktail. The addition of pineapple and mango juices to the standard Moscow Mule’s vodka and ginger beer creates the tropically flavored Mule of Paradise. Whipped cream vodka is combined with Malibu Rum and Blue Curaçao to produce a beautiful azure-colored drink, Adios Summer. Mixologist Savannah Bergen deftly prepares Annata’s craft cocktails, including one of Annata’s signature martinis, the Spice of Life. This cocktail contains the restaurant’s house-made sweet and sour mix, which adds a fresh yin and yang sapidity to the drink. Making your own sweet and sour mix is amazingly easy and definitely worth the small amount of effort expended. Place sugar and water into a medium saucepan and stir until sugar is completely dissolved. Bring to a boil, and then simmer for 3 to 5 minutes. Remove from heat and stir in juices; refrigerate for up to 3 weeks. 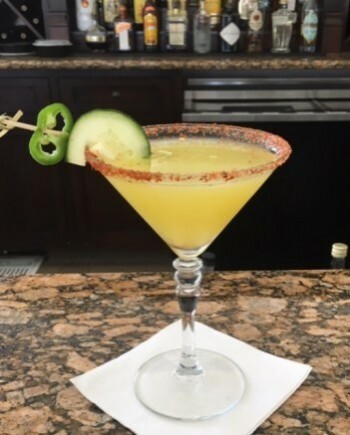 The Spice of Life cocktail is refreshing and delicious with just the right amount of “kick.” For those not familiar with Tajin, which rims the martini glass, it is a piquant seasoning condiment powder that is made with chili peppers, salt, and dehydrated lime juice, and is available at most grocery stores. Muddle agave, jalapeno, cucumber, and cilantro in a mixer. 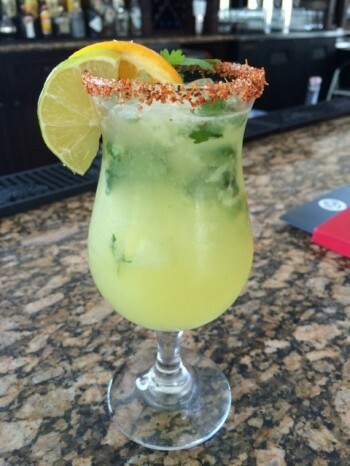 Add ice, liquor and juice; shake and pour into Tajin rimmed martini glass. Garnish with a Tajin tossed cucumber and a slice of jalapeno (optional). Photos taken by Linda Stewart and Todd Montgomery.